After the jump, this article includes charts and graphs of crime reports, more detail on the impact of retiree health care on the budget, the budget outlook for FY 2013, and the city council’s work schedule for ratifying the FY 2013 in late May. Some elements of budget timing leave very little room for flexibility. The city administrator is required by the Ann Arbor city charter to present a budget to the city council each April. And the administrator’s proposed budget must be adopted by the city council, with any amendments the council wishes to make, no later than the council’s second meeting in May. This year, those constraints have translated into the following schedule. The schedule indicates an apparently late start compared to the last three years, when the council has held off-site retreats to identify priorities and goals, starting in December or early January. Of those three years, the second was actually an exception to the strategy the council has tried to use since CFO Tom Crawford came on board six years ago: Plan in two-year cycles, even though the council adopts budgets one year at a time. On that strategy, every other year should work out to be a fairly straightforward exercise of making minor adjustments to the plan already in place. So in late 2009, when the city was preparing its FY 2011 budget, that would have ordinarily been a light year for budget work. However, given the dramatic economic downturn a few months before, it wasn’t possible to pursue a strategy of making minor adjustments. Counting that middle year, the council’s pattern over each of the last three years has been to start in December or early January. So this year’s “late” start, though apparently an exception, is essentially a return to the two-year planning approach. At the Feb. 13 work session, Nancy Walker, executive director of Ann Arbor’s employee retirement system, sketched out some background on the system, including its board membership: Jeremy Flack (fire trustee, chairman); Alexa Nerdrum (citizen trustee, vice chairman); Dave Monroe (police trustee, secretary); Terry Clark (general member trustee); Tom Crawford (city CFO); Brock Hastie (citizen trustee); Mark Heusel (citizen trustee); Steve Powers (city administrator); and Brian Rogers (general member trustee). (1) The City Administrator and the Controller to serve by virtue of their respective offices; (2) Three Trustees appointed by the Council and to serve at the pleasure of the Council; (3) Two Trustees elected by the general city members from their own number (general city members being members other than Policemen and Firemen members); and (4) Two Trustees elected by the Policemen and Firemen members from their own number. The revised charter language, which was approved by voters with a margin of 68% to 32% (with a majority in every precinct of at least 61%) retains nine members but distributes them differently, most notably by eliminating from the board the city administrator and one of the trustees elected from the general city membership. The revised board composition is: (1) the city controller; (2) five citizens; (3) one from the general city employees; and (4) one each from police and fire. RESOLVED, That if the amendment is adopted, the City Administrator and City Attorney shall immediate commence negotiation with the City’s collective bargaining units to implement the amendment and present to Council the necessary ordinance and contract documents for adoption to make the amendment effective. Although the new city administrator, Steve Powers, is serving on the retirement board until the new board composition is collectively bargained, the terms of his contract state that he is not a beneficiary of the city’s retirement plan, but will instead have a 401(a) plan. The rationale for the change in the board’s composition was to reduce the number of board members who are also beneficiaries of the plan. At the Feb. 13 work session, Walker reported to the council that most of the blue-ribbon panel’s recommendations had now been implemented. By way of additional background, the city’s retirement program is supported in part by the levy of a retirement benefits millage [labeled CITY BENEFITS on tax bills], currently at a rate of 2.056 mills, which is the same rate as the city’s transit millage. A mill is equal to $1 for every $1,000 of taxable value of a property. Walker noted that the retirement system had undergone many changes in its administration, but described the transition as smooth. Among those changes include a new investment manager, a new medical director, a new pension analyst and a new executive director. Walker had joined the Ann Arbor retirement system in January 2011 after Willie Powell had retired in June 2011. Powell served as executive director for the retirement system for 11 years. Walker also noted that the actuary used by the system as a consultant is also new. Previously the city’s retirement system had used Gabriel Roeder Smith & Company. Starting in 2011, the city began using Buck Consultants as its actuary. The Buck Consultants representative who handles the city of Ann Arbor, Larry Langer, was employed for 10 years by Gabriel Roeder Smith. 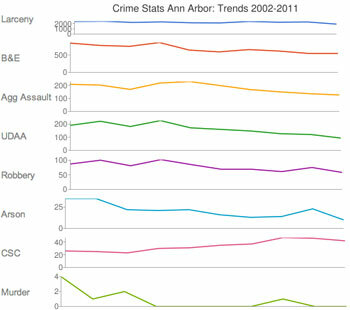 City of Ann Arbor retirement system funded ratio graph. Key takeaway points given by Langer to the council included the fact that the pension fund, for FY 2011 (ended June 30, 2011) had greater investment returns and lower salaries than expected and more retirements than expected. All those changes generated better-than-expected results compared to the June 30, 2010 projections. For FY 2013 the expected employer contribution is now $9,748,510. Based on projections from the prior year’s June 30, 2010 valuation, it had been expected that the city would need to contribute a total of $10,784,00 to the pension fund in FY 2013. 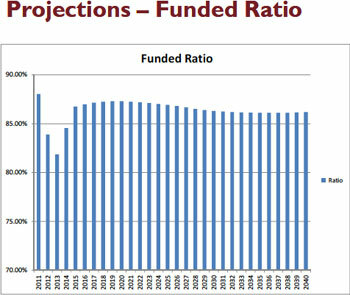 The funded ratio for the pension fund at the end of FY 2011 was 88%, which is a drop from the end of FY 2010 (June 30, 2010) when the funded ratio was 90.3%. But that’s less of a drop than was expected, Langer said. Based on projections from FY 2010 valuation, he had expected a funded ratio of 86.3%. For FY 2012-14, the dip in the valuation, and the corresponding spike in required employer contributions, drew some questions from councilmembers. Langer explained that the dip corresponded to the economic downturn in 2008-2009. The valuation is keyed to a rolling five-year average, in order to damp the volatility of the measure, so those years continue to have an impact on the valuation until at least five years have passed. Langer cautioned that the funded status will continue to slip in the next few years as the last of the returns from the down years in 2008 and 2009 are reflected in the valuation. On the VEBA side, which funds retiree health care, key presentational takeaways for the council were greater investment returns than expected, lower salaries than expected, and fewer claims. For the coming fiscal year 2013, the expected employer contribution for employees citywide is $12,379,000, not including some adjustments and interest. Retirement/VEBA Allocation: VEBA Allocation Policy – How Much? When the city’s chief financial officer, Tom Crawford, took the podium, he contrasted the expected employer contribution with the number that had originally been planned for FY 2013: $15.3 million. That reflects a citywide savings of roughly $2.9 million. A number of factors contributed to the reduced cost, including a higher return on investments – 28% last year compared with the standard assumption of a 7% return. Crawford also pointed to ordinance changes reflected in recent collective bargaining agreements, which reduce the health care costs to the city for active employees. And employees hired after July 1, 2011 have an access-only retiree health care plan. But Crawford noted that the investment returns and the claims amounts – which had contributed substantially to the savings – are relatively volatile and could reverse in the future. So, of the citywide $2.9 million savings, Crawford recommended that the city continue to contribute $2.5 million of it to the VEBA to pay down unfunded liability and reduce future expenditures. In his presentation, Langer had noted that the VEBA is only 34% funded. On that figure, Langer said that the council might wail and gnash their teeth over the low amount, but it’s still 34% more than a lot other communities. Crawford also noted that putting $2.5 million of the $2.9 million savings toward the VEBA would help pay down the city’s other post-employment benefit obligations (OPEB) – the city has a $12 million OPEB obligation arising from a settlement with the IRS. Crawford hopes to have that obligation paid off in 5 years. Crawford noted that the city’s contribution to the VEBA has typically been more than the retiree health benefit costs. And the excess in the contribution, beyond the cost of claims, contributes to pre-funding future benefits. However, because of the increased number of retirees and the rising cost of medical care, the cost of claims is expected to exceed recommended employer contribution in the future. And that will mean that the city will have to rely more heavily in each year on the accuracy of the assumptions underlying the contribution (like at least a 7% return on investments). In that context, Crawford recommended a VEBA funding policy that makes future city contributions to the VEBA based on the FY 2012 level – but adjusted up or down as a function of the total general fund revenues. That would provide better stability in financial planning and investing, and reduce radical changes in city expenditures, Crawford concluded. Crawford’s recommended strategy for the overall citywide retiree health care funding level does not call for the kind of reduction in the city’s contribution that could be achieved if the actuarial OPEB cost were used to determine the city’s contribution. 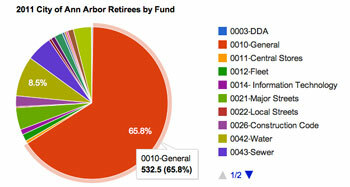 City of Ann Arbor retirees by fund (department). The majority of city retirees – 65.8% – worked in positions paid for out of the city's general fund (red wedge). However, a different policy change – one that would assign contributions to those city departments (funds) based on where the future liability is being accrued – would have the effect of saving the city’s general fund roughly $1 million a year. Under the current system of allocating the city’s retiree health care costs, roughly 73% goes to pay retiree health care claims and the remaining 23% goes to pre-funding – through payments into the VEBA. It’s a hybrid between a pay-as-you go approach (in which each year’s retiree claims are paid out of the current year’s budget) and a pre-funding approach. 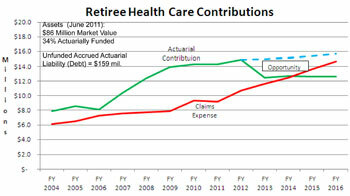 The current method essentially treats all retiree health care claims in any given year as unfunded liabilities. That approach means that a city fund (department) with a relatively high number of retirees compared to currently active employees has a relatively higher retiree health care contribution compared to other city funds. 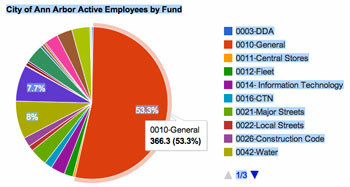 City of Ann Arbor active employees by fund. While the majority of city workers are paid out of the general fund (53.3%), it's a lower proportion than the number of retirees paid out of the general fund (65.8%). The new approach Crawford is recommending is a true pre-funding approach, and takes into account where the new liability is accruing. The city has already made contributions to the health care of retirees, so not all of the retiree health care claims in a given year are unfunded liabilities – part of those claims have, in a sense, been pre-funded. So the accruing liability is with currently active employees as they work each additional year. And eventually, as new hires who came on board after July 1, 2011 are vested in the system, the city will see just a $2,500 per year liability in connection with those employees’ access-only plans. So instead of a 73%/27% split, the new allocation methodology would work out to 40%/60% – with 40% going toward the unfunded liability due to existing retirees’ health care and 60% going toward the accruing liability of active employees. The effect of that shift has a variable impact on different city funds (departments), based on the proportion of retirees and active employees associated with each fund. In late 2011, for example, the general fund had 366.3 active employees, compared to 532.5 retirees. By way of contrast, the parks maintenance fund had 22.59 active employees, compared to just 10 retirees. So for the general fund, under the new methodology recommended by Crawford, the total retirement health care allocation would drop from $9,600,241 to $8,584,649, for a savings of roughly $1 million. But for the parks maintenance fund, the retirement health care allocation would increase from $258,909 to $322,960. The $1 million savings to the general fund – which would result from the retiree health care funding methodology recommended by city CFO Tom Crawford – figures into the overall budget outlook for FY 2013 presented to the council by Crawford. He began by putting the current year’s budget discussion in the context of the general economic and political climate. Unemployment is improving, he said. In the Ann Arbor area, the unemployment rate stood at 5.5% in December 2011, compared to a rate of 9.3% across the state of Michigan. State sales tax receipts are coming up from their depressed levels. Short-term interest rates are still near 0%. Property tax revenues are fluctuating slightly. Revenue from the federal stimulus package is disappearing. He noted that the state legislature is still considering the elimination of personal property taxes, but has focused little discussion on addressing the structural funding issue for local governments. Crawford noted that for the previous fiscal year, the city had broken even, when it had planned to spend down the fund balance by roughly $1.5 million. Crawford told the council that again this year, for FY 2012, the city is working realistically to break even, despite having budgeted to tap the fund balance for over $1 million. If the city does break even, that will result in maintaining its $10,525,445 in unassigned reserves, which is 13% of annual expenditures. The increase in revenues and reduction in expenditures resulted in a net surplus of $1.6 million for FY 2013. Crawford cautioned against spending that surplus, even on one-time items, and advised instead that it be added to the city’s fund balance. The reason for his caution is based on a continued projected increase in expenses in FY 2014-16 of around 2% per year – which he characterized as about what you’d expect in a organization where the primary expense is employee compensation. Personnel costs outpace inflation, he explained. Against that 2% increase in expenses, the city is projecting only a 1% increase in revenues. On that basis, Crawford is currently projecting that the city would need to spend $792,973 of its fund balance in FY 2015 and $2,112,030 in FY 2016. In order to guard against any future economic downtown, Crawford said he’s advising that the city increase its fund balance reserve target to the range of 15-20% of annual expenditures. It currently stands at 13%. Still, Crawford said that compared to previous years, it was a nice forecast, with basically a $1 million challenge to meet in coming years – compared to the $2.5 million in savings the council had needed to find in previous years. Out of the $1.6 million surplus anticipated for FY 2013, one new program that Crawford is recommending the city fund is a pilot program for recruiting police officers. It would cost $150,000. At the Feb. 13 working session, chief of police Barnett Jones explained that the rationale for the program stemmed from difficulties with the hiring process to replace nine officers who retired at the end of 2011. The city received a few hundred applications, but Jones told the council that seven of the nine candidates it had initially identified didn’t turn out to have the kind of backgrounds that rose to the level of professional standard that AAPD wants. The pilot program would give the department a chance to work with officers on the beat before being hired on as full-time sworn officers. They’d work under the supervision of an AAPD officer and would spend a portion of their time downtown addressing nuisance issues. Despite the net gain of 10 officers now anticipated for FY 2013, compared to the AAPD staffing levels in the two-year plan, the department’s 118 sworn officers leave Jones short of the number he’d like. 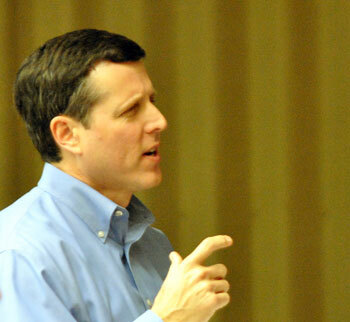 At the working session, he described the “perfect” number of officers for Ann Arbor as 150. As a possible theory on why that category of crime has increased, Jones ventured that it’s the kind of crime that carries with it a stigma that acts as a barrier to reporting it. As women are increasingly comfortable reporting such crimes, the numbers have risen, he theorized. At the working session, Jones rejected the idea that for other crimes the decrease in frequency could be attributed to a decreased number of officers – the idea being that are simply fewer officers to take the reports, leaving more crimes unreported. Jones said that for these types of crimes, he thinks it’s unlikely that anyone would fail to report them – in many cases they’re tied to payouts of insurance claims. I really like the links to the live charts. Very impressive. Thank you, as always, for providing this type of report. Although I sat through the presentation listening actively, I greatly appreciate the added insight and background I get from The Chronicle.